Waiting for Godot is my third existentialist play and I’m beginning to wonder… what’s the point? (Okay, yes, that was an existentialist joke… wait, do those even exist?) As I sat down to write my review, I realized that even though I had a general idea of what qualified as existentialist, I decided to look up the definition, just to be sure. Wikipedia gives this definition of existentialism: “Søren Kierkegaard … maintained that the individual has the sole responsibility for giving one’s own life meaning and with living lie passionately and sincerely, in spite of many obstacles and distractions including despair, angst, absurdity, choice, boredom, and death.” This definition is the best way to describe what happens in Waiting for Godot. This rendition of Samuel Beckett’s play is a well done existentialist play. The actors did a fantastic job – incorporating hopelessness, camaraderie, horror, and humour into a rather repetitive dialogue. A highlight of the acting was the skill the actors demonstrated through their facial expressions. Sometimes, in between lines, actor’s eyes, faces, or sometimes even bodies fall out of character. Not so in Waiting for Godot. Everyone was acting with their entire body every second they were on stage – a huge accomplishment for Farren Timeteo (in the role of Estragon) and Nathan Cuckow (in the role of Vladimir) who were on stage for the duration of the 2 ½ hour play! In particular, George Szilagyi’s (Lucky) facial expressions and movements communicated more than his (impressively long) “thinking” monologue. The make-up and costumes were also impeccable, transporting the audience into a timeless, hopeless, vacuum with characters who have all lived a hard life. The make-up – done in a dark, dramatic way – also helped emphasize the character’s facial expressions. The set was striking as the audience walked into the theatre– extending almost to the risers, the set immediately made me feel as though I was walking into a barren wasteland, where the only thing to really do was wait… wait for something to change. The repetitive dialogue in Waiting for Godot forces the audience to create meaning… a reason for attending. It also forces them to find humour where, ordinarily, there might not be any. During the February 3 performance there was a group of audience members having a great time and laughing throughout the play. They started when Lucky first took to the stage, and I couldn’t bring myself to join them. Laughing at the plight of an exhausted, enslaved, disregarded human is something I just couldn’t do during Lucky’s first appearance. I was too disgusted by the character’s apparent disregard for him. But by the middle point of the 1 ½ hour first act, I was desperately searching for something to anchor me in the play, and as perverse as it seems, that anchor ended up being laughing at Lucky. This interpretation of Waiting for Godot did a great job at getting the audience to that point. Repetitive sequences of questions and answers were quickly exchanged between Timeteo and Cuckow, drawing audience into their world – void of anything but the present moment… or the distraction we’re focusing on in the present moment. 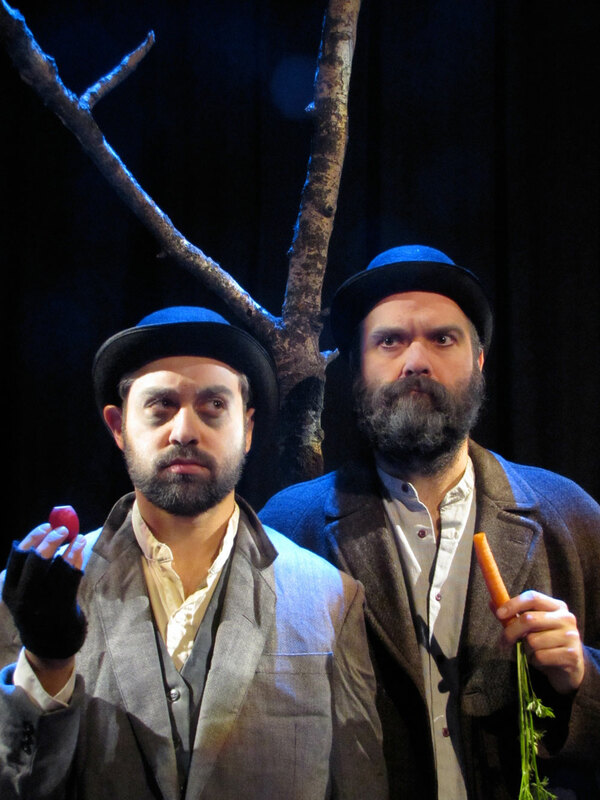 Wishbone theatre’s interpretation of Waiting for Godot is a solid one, if you enjoy existentialism in theatre. For those who don’t, or even those who are neutral on existentialism, I’d recommend staying away.